The BELLA carpet which Susan stitched works beautifully in the pink bedroom of her ‘Toll House’, which she bought from Dolls House Emporium. 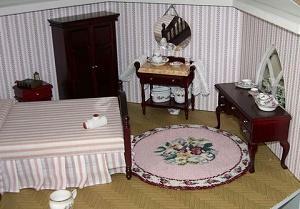 This was her first attempt at setting up a dolls house and it is still a ‘work-in-progress’. 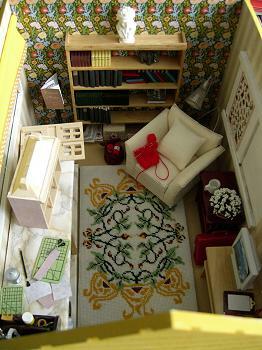 Susan’s Sanctum, seen from above, with the JOSIE carpet, in her own choice of colours, on the floor. Another view of the hobby room. Of course, it has to contain a doll’s house in the process of being put together! Susan has recently completed this wonderful room box. 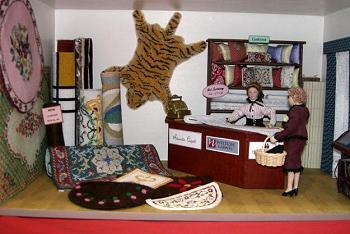 It is a carpet and soft furnishings department which she made for the Sunderland Dolls House Club – it was part of a joint project that the club did, to make a whole department store. It contains several of my kits. For instance, you can see the tiger skin rug on the back wall, Barbara green and Bella (the round one) on the left hand wall, Alison gold, Karen (William Morris style) and Susan’s own colourway of Josie. On the shelf unit behind the counter are a Summer Roses bolster, as well as Sophie and Prudence cream cushions. 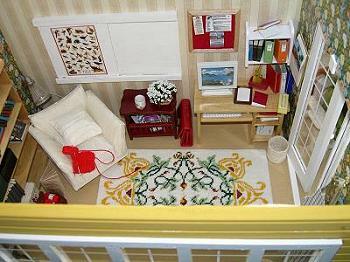 Susan says that the room box has been dismantled now, as she needed the carpets back in her houses! !